Organizations involved in the resistance which you can support, either through work or monetary donations-or both! This entry was posted in Indivisible, The Resistance, Uncategorized by Tina. Bookmark the permalink. YES!!!! I marched in Washington and put up a similar sign in my garden after the election!! LOVE THIS POST! I’m not surprised…:) Go you and us! It’s taken a while for me to get this sign–I think they’re backlogged! May I share this, Tina? Hi Dottie! Yes, please share! Great minds do work alike if I may be forgiven for putting it that way. 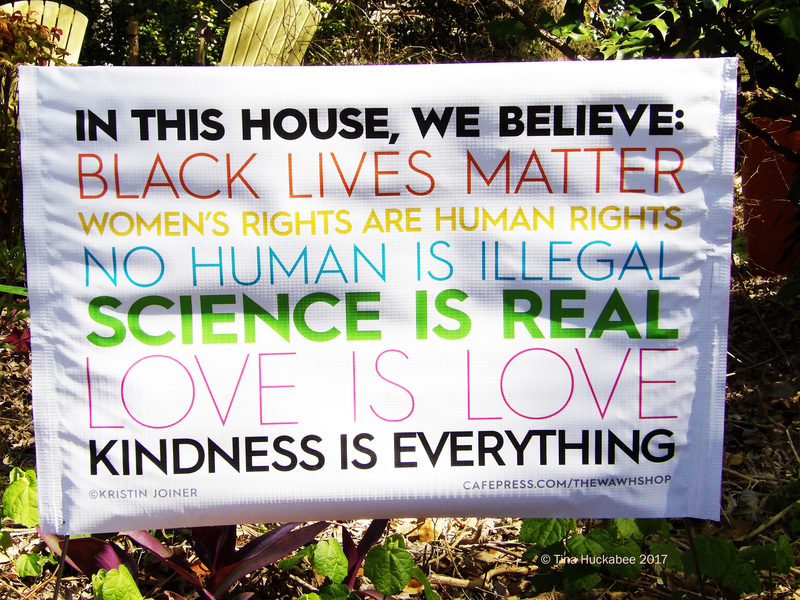 The day I spotted a couple of these signs in my neighborhood I searched for and ordered my own. Of ALL the yard signs that have been seen around town in the past 6 months….THIS one is my all time favorite! I am so proud to have you as company in this effort! And…thanks for helping spread the word! Hey Deb!! These ideas are those expressed by the majority of Americans–we mustn’t forget that, regardless of what our “leaders” say. In the neighborhood just south of me, there are a bunch of these signs and I’d meant, long ago, to research how to get one. Alas, forgetfulness rules. In our neighborhood, there are a handful. I ordered weeks ago! A wonderful sign and I have gone to the link so that I can order one. Thanks for a great post. Yay! Thanks–it was an easy post. Oh, I saw one of those signs the other day and wondered where to get one! There are several now in our neighborhood, Amy–and more to come, I think! Tina from Spain I am with you. Ahead! Greetings from Margarita.